The getaway to the lower Alexander Valley wineries features small and delightful tasting rooms and views. The combination of unique wineries and absolutely beautiful rolling hills of vineyards is hard to match in any wine country. We highly recommend you pick up your picnic lunch at the famous Jimtown Store which is located on Alexander Valley Road. From the Healdsburg Square, travel north along Healdsburg Ave for 3 miles (about 1 mile past Simi Winery). Watch for the sign pointing the way to the Alexander Valley Road. Turn right onto Alexander Valley Road. Jimtown store will be on your left about two miles or so on Highway 128. For those wine country lovers that are adventurous, try the Medlock Ames winery up on Bell Mountain Ranch. It is off Chalk Hill Road. Read about Medlock Ames. Enjoy the many faces of the Alexander Valley wineries. We recommend that you visit no more than three wineries in one day. Take in a leisurely picnic along the way. After stocking up on your picnic goodies at the Jimtown Store, backtrack a very short distance to the first intersection. The Alexander Store is on the west corner. Turn right and travel north for about a mile and half. Turn right into the driveway for Stryker. This is a very new winery with a beautiful tasting room facility. The tasting room is spacious providing fabulous views of the Alexander Valley vineyards. This is the perfect spot to enjoy your picnic lunch. Enjoy your lunch with a glass of Stryker’s delightful Semillon, a delicious and dry white wine not often found as a varietal. You will find the Stryker wines to be of excellent quality. Note: Stryker Sonoma sold to Foley Family Wines on April 20, 2016. Look for possible changes? From Stryker head back and turn left onto Highway 128 at the stop sign and follow the road as it turns to the right. Watch for the White Oak Vineyards and Winery entrance on the right. The winery was first established in 1981 as a small winery producing just a handful of wines from a single vineyard. In the years following, owner Bill Myers, brought in partners and purchased additional vineyards. The winery opened a new Mediterranean tasting room in 1998. Today the winery is making a line of excellent wines. At our recent tasting, we tasted five wines that were well made and full of character. The Zinfandel and the Syrah are incredibility good. The grounds are very nicely landscaped and the winery has an inviting atmosphere. The tasting room is elegant and a walk up the staircase leads to a display of prints and photographs. The view of the surrounding vineyards is a delight. For many years we drove past this old and abandon winery on the Alexander Valley Highway. Ken and Diane Wilson who own several wineries in the Healdsburg area purchased the property and did a bang-up job getting this winery back up and running. It is a delightful tasting room with a load of space to wonder and view some interesting artwork. Outside is a decent picnic area. All in all, a fun place to visit and taste wine. By the way, Soda Rock has a lodging room if you are interested. Tasting room open daily 11 to 5 pm. Just down the road from Johnson’s and to the left is Alexander Valley Vineyards. This family-owned winery was purchased in 1962 by Harry and Maggie Wetzel. Shortly after, vineyards were planted and in 1975 the family built the winery and tasting room. The estate land once belonged to Cyrus Alexander for whom the valley is named. The winery produces 80,000 cases annually on 125 acres of vineyards. They produce nine different types of wines so you should find something here to your liking. Don’t pass up a bottle of the Sin Zin if it is available. Your next stop is just a short mile away. The Hanna Winery is located to the left on Alexander Valley Road on a stunning hillside. Travel up the driveway to the tasting room that was built just a few years ago. 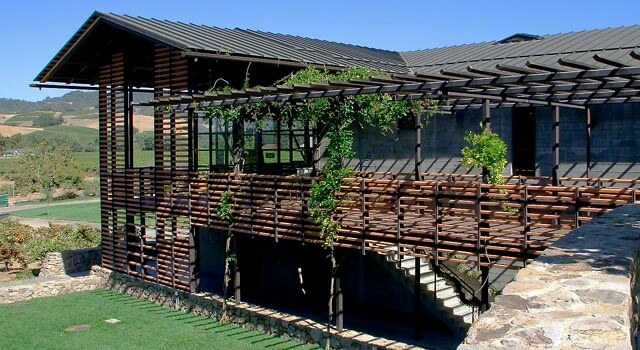 It’s a beautiful tasting room and offers an exciting view of the lower Alexander Valley. The winery is owned by Dr. Ellis Hanna, a famous San Francisco cardiologist. The winery produces excellent wines. The Sauvignon Blancs and Chardonnays are particularly good. The 1999 Cabernet has been highly rated and is an excellent value at its price. First time to a winery in Healdsburg? Find out what happens in a typical tasting room. Most wineries in the Healdsburg charge a tasting fee. Expect to pay $10 or more to taste. Two people can always elect to share a tasting. If you cannot picnic, enjoy a delicious lunch at one of Healdsburg’s many fine restaurants.